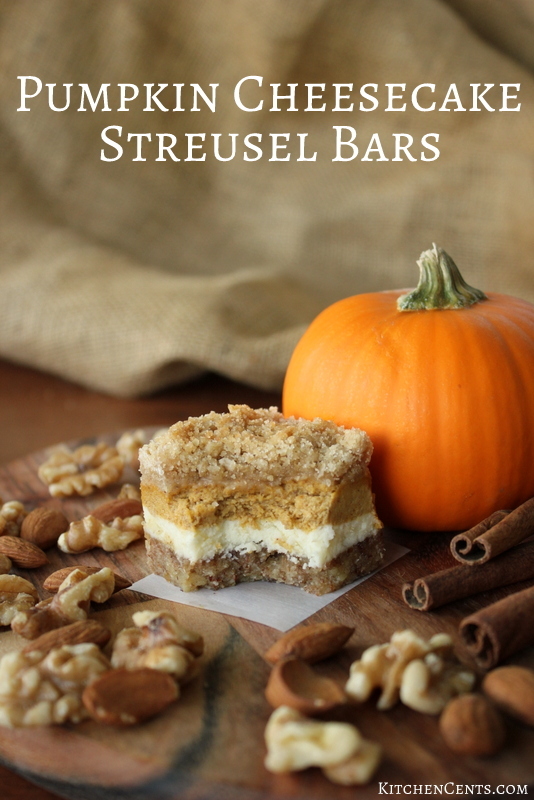 Amazing Pumpkin Cheesecake Bars — two layers of delicious cheesecake on a rich cinnamon almond walnut crust all topped with an easy streusel. 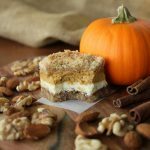 If you’re looking for a pumpkin pie alternative this fall season, these pumpkin Cheesecake bars will be sure to please. Decked out with not one but TWO layers of rich creamy cheesecake, topped with an easy cinnamon streusel and sit on top of a delicious almond walnut crust. 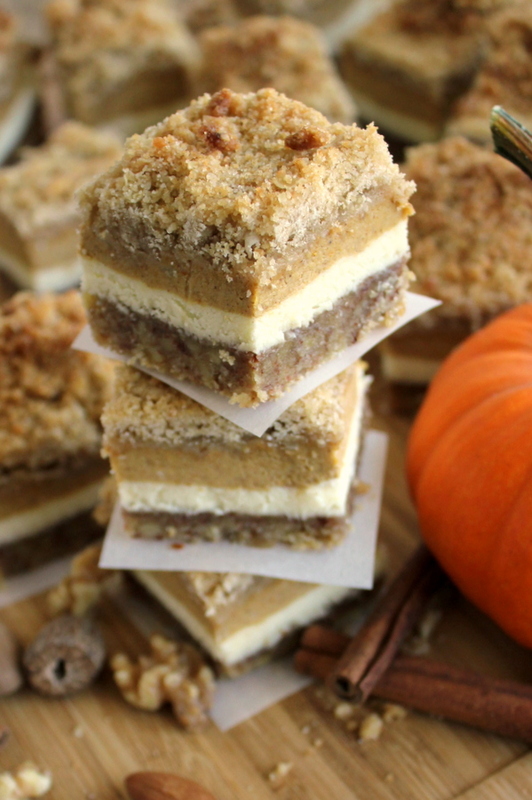 Even the strictly traditional pumpkin pie lover, will enjoy a piece of this amazing pumpkin cheesecake bar this holiday season. I’m a cheesecake lover, through and through! If I could have a piece of cheesecake every night I would be in heaven. Anytime I can switch up flavors and try a new cheesecake recipe, I’m there. With pumpkin season here, what better recipe to share than a fabulous, rich pumpkin cheesecake recipe. It seems like a lot is going on in this recipe but it’s actually really easy. Walnuts can be crushed by using a bag and rolling pin, food processor or blender. If the walnuts turn into walnut butter, it’s not a big deal. I like this crust with little bits of walnuts but if you prefer a smoother texture, by all means, make nut butter. 😉 After the nuts are crushed you’ll be ready to mix the crust up. Once made, the crust mixture will be ready to be pressed firmly and evenly into the bottom of a 8×8-inch baking dish lined with OVERHANGING parchment paper. The parchment paper helps when it comes to removing the bars to cut. Next, the cheesecake layers! 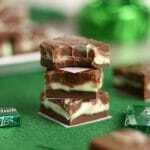 Even though there are two distinct, separate layers, they are easy because they’re made at the same time. You’ll mix the cream cheese, sugar, vanilla and eggs together to make the white traditional cheesecake layer. Once the white traditional cheesecake layer is mixed, part of it is removed (pouring it over the nut crust) then the remainder is used to make the gorgeous orange layer. Pumpkin and spices are added to the second cheesecake layer to create that perfectly delicious pumpkin spice layer. Once the beautiful pumpkin cheesecake batter is mixed until smooth, you’ll very carefully pour or spoon it onto the white layer. Note, you’ll want to be very careful when pouring or scooping the pumpkin layer onto the white layer. To get two distinct layers the white layer needs to stay even. If you pour the pumpkin mixture with a big plop, the pumpkin layer will sink into the white layer and make your layers uneven. This streusel is so easy. It consists of sugars, oats, flour, butter, salt, and vanilla. 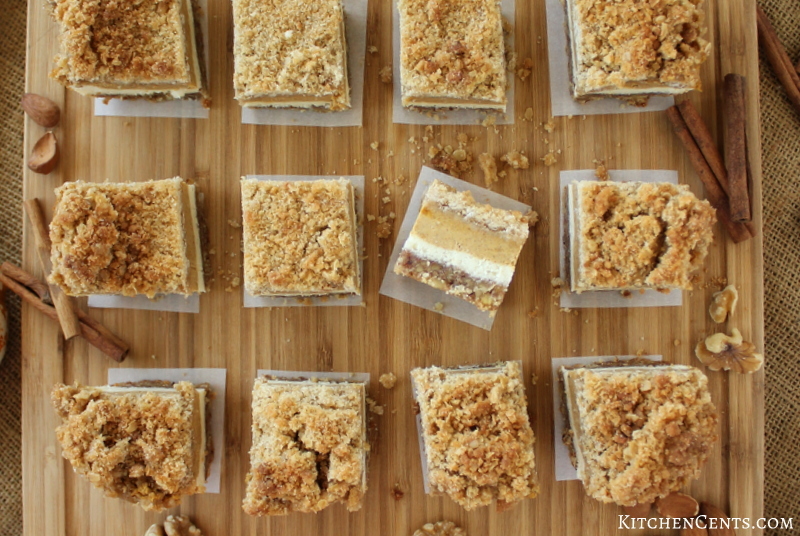 It makes a crumbly rich addition to these pumpkin cheesecake bars. It adds that something extra but if you’re not a fan of streusel, no pressure here, you could leave it off. Once the streusel topping is made, just sprinkle it evenly over the top of the pumpkin cheesecake layer. It’s time to bake the bars. 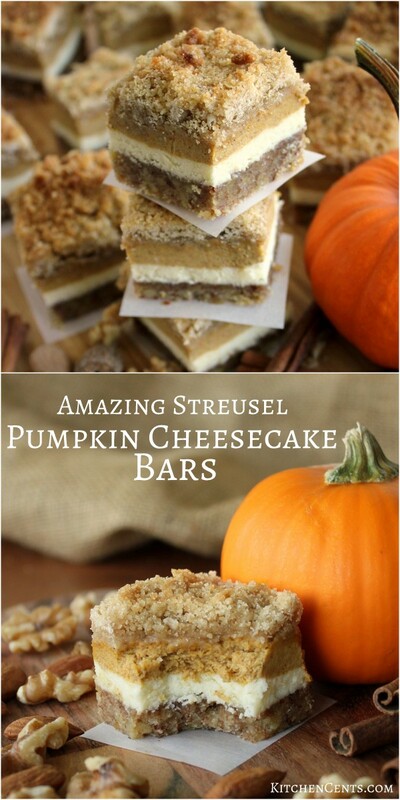 These pumpkin bars, with there delicious cheesecake layers and pumpkin spice fragrance, come out beautifully! The color of the crust against the white and fall orange colored layers look amazing and taste even better. This recipe is a one you’ll want to share, with a serving size of 16! Enjoy this pumpkin cheesecake recipe at your next fall gathering! Everyone will be raving about them. 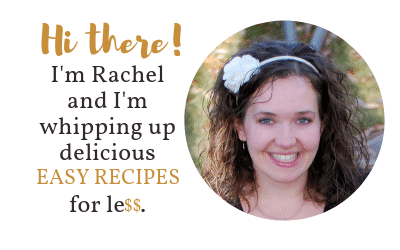 What’s your favorite fall time recipe? 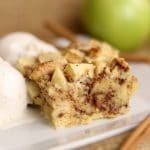 Looking for more delicious fall desserts? These ones are great! 2 8 oz cream cheese room temp. 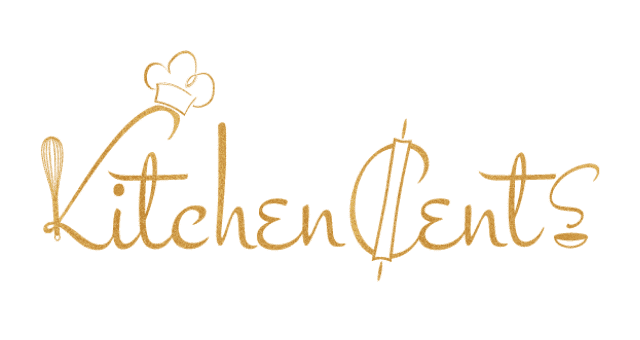 Preheat oven to 350 degrees F. Line 8x8-inch baking dish with parchment paper. Mix ingredients together until wet. Press evenly into 8x8-inch parchment-lined baking dish. Mix room temperature cream cheese and sugar together. Add eggs. Remove 1 1/2 cups out. Pour over walnut crust. Evenly smooth over crust. Add to remaining cheesecake mixture, pumpkin puree and pumpkin spice. Carefully spoon orange pumpkin cheesecake mixture over white cheesecake mixture. Do not mix. Blend ingredients together. The mixture should be wet but crumbly. Carefully sprinkle streusel over pumpkin cheesecake layer. Bake at 350 degrees F. for 60-70 minutes or until done. 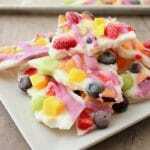 When done, cool slightly then place in fridge or freezer to chill. Chill for at least 2 hours before removing from pan and cutting. Thanks Amy! They are soooo good! !